After your customers receive hair treatment using steamers, or other salon and spa services, they definitely need the hair twist wrap. Usually, hair wraps are very difficult to tie, and need a lot of practice to tie perfectly. To ease the problem of tying a hair wrap, Salonwear provides the terry hair wrap twist. It is also called twist towel hair wrap and is the best kind of wrap for wet hair that needs to be held in place. 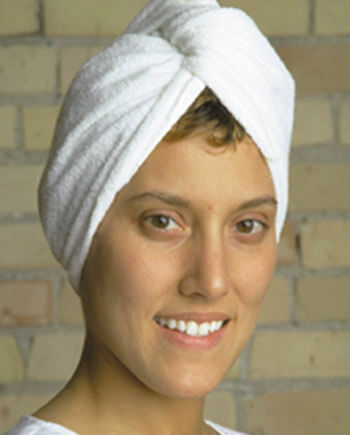 The twist towel hair wraps, offered by Salonwear, has a button and elastic straps, which hold the hair securely. Due to this feature, the terry hair wrap twists can be used to hold both long and short hair in a firm position. A wide range of headbands also includes turban and terry headbands, which are best cozy and durable. Along with the twist and tie hair wrap, Salonwear has a wide range of other salon products, accessories, and apparel for your salon. These include but are not limited to, salon capes, cutting capes, spa uniforms, headbands, shampoo capes, salon client gowns, hair stylist smocks plus size, spa body wraps, spa robes, aprons with pockets, salon vests, designer jackets, and many more! Since Salonwear only believes in supplying innovative fabrics, the terry hair bun twist wrap product assures the same as well. Although the product comes in a fixed size, the extremely stretchable knit terry fabric, made from a mixture of 75% cotton and 25% polyester, allows you to easily adjust the shape and size of the hair twist wrap as per hair length and volume. The unique design of the product soaks the water quickly, leaving your client’s hair dry in no time! Since white is the most widely used color, and the ideal color for use in any spa or salon, Salonwear offers you this hot selling turbo twist hair wrap product in a classic white color. This white twist towel hair wrap is super lightweight too. Why choose Salonwear for Twist Hair Wrap? Enthralling the salon industry since the past 31 years, Salonwear has always been eager to identify, understand and cater to the ever-growing needs and demands of its clients. Salonwear has years of experience in this industry and now proudly has a large network of happy and loyal customers. We have built this family over many years of hard work and service. We are USA based and have the best of employees and designers. All the accessories and apparel offered by us are chic, comfortable, trendy, innovative and uniquely designed to promote your business. Started as a family business, Salonwear has always outperformed its rivals by selling top quality spa and salon apparels and accessories. We have achieved growth at a rapid pace, adding new clients to the Salonwear family!